The Historic Centre of Camagüey has an unusual radius-concentric urban model. The nucleus is the Plaza Mayor, from where numerous churches and convents can be found in equidistant position to the four winds. Most of Camagüey’s churches are the result of the city’s prosperity in the 18th century, when so many new ones were built that it got the nickname “City of Churches”. The city’s domestic architecture is reminiscent of Andalusia. Clay is used as the main construction product, both in buildings and in the large earthenware jars that were used for storing water. Houses are generally low, having one floor only. The streets are narrow, opened up by 7 large squares and 13 smaller ones. 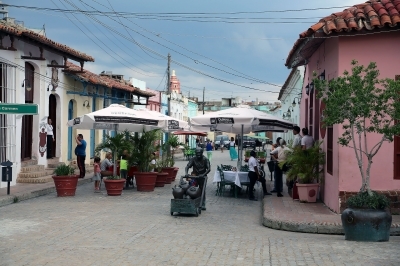 Camagüey (then named Santa Maria del Puerto del Principe) was built in 1528 as one of the first Cuban villages. Nowadays it is Cuba’s 3rd city in number of inhabitants. The Camaguey nomination file has the length of an Fidel Castro average speech. Every ice cream parlour is named. This is not helped by an El Cheapo-translation into English of the file. Why this has become a WHS is a mystery, and it remained that way after I had visited the place. It’s not an unfriendly city though. 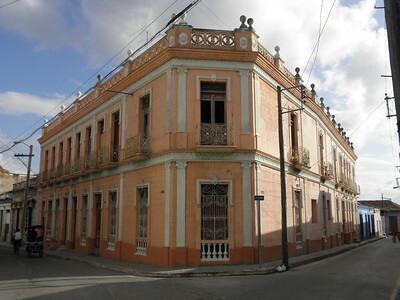 It probably has more “normal” city life than the average Cuban town: a large shopping street, terraces on the main square. Lots of churches too. It is definitely pleasant to walk around for an hour or two, exploring the many little and larger squares. But that’s about it. The nomination draws heavily on Camagüeys Andalucian touches, but you’ll need a lot of imagination to see this parallel. The large clay jars I only saw deliberately placed on the town’s tourist trail: in the former convent/museum and next to the main church. As described, this city, founded in 1528, provides a unique irregular urban layout plan with numerous squares dominated by religious buildings. Such irregular street design was likely needed to confuse and make life difficult for possible invaders (didn’t help as Henry Morgan burned the city). There is in fact several squares dominated by a church or colonial building and connected by narrow streets. Our most favorite was Plaza del Carmen with lovely sculptures of locals doing everyday staff, like carrying famous clay pots or reading newspapers. It is also place for excellent Martha Jimenez Perez gallery. She is one of the most famous contemporaneous Cuban painter. We even purchased beautiful sketch for 80 CUCs. In overall, decent city with its pluses and minuses, not star attraction, probably deserving WHS status. I visited Camaguey in April 2011. Normally I love the cuban people, but I found them overwhelming as they hounded me in the city limits. The preserved old town is beautiful, but surrounded by the slums characteristic of a third-world city. The streets are very narrow and seemed very difficult to navigate (I was not driving). Am I glad I went? Yes. Am I glad I paid for a tour instead of trying to make my way through the city myself? definitely. Would I revisit the city? Probably not. That said, the province of Camaguey itself is beautiful. History of Aviation: "An event of worldwide connotation was the Camagüey Sevilla flight, made by the Spanishes Mariano Barberán y Joaquin Collar in 1933. They flew the airplane so called 'Cuatro vientos'.."(nom file). It was the longest Atlantic Ocean crossing until then. The plane disappeared when continuing from Camaguey to Mexico.